One of the closest hotels to Manchester Airport with complimentary 24-hour shuttle bus to terminals. When travelling by car, please ensure you use the full hotel address and not just the postcode. For sat navs, please use the full hotel address with postcode M90 4HL. Although the hotel is within short walking distance of Manchester Airport Terminals 1, 2 and 3 we recommend using our complimentary 24-hour shuttle bus to the hotel. Simply dial 3090 from any courtesy phone in arrivals halls, information desks or at the airport station, or call the hotel, and our award-winning, friendly drivers will direct you to the closest pickup point. Returning to the airport or station please see reception who will arrange your complimentary shuttle bus transfer. Manchester Airport Station has direct trains to over 100 destinations. Currently, there are services to Manchester Piccadilly every 10 minutes during peak times with journey time to the city centre just 22 minutes. Train connections to London Euston are available via, Wilmslow, Stockport, and Manchester Piccadilly. Manchester Airport Train station is within 5 minutes walking distance to the hotel, bear left out of the station and follow the pedestrian footpath towards T1, cross the main road at the traffic lights and continue to follow the footpath where you will see the hotel. We offer complimentary shuttle bus transfer to and from Manchester Airport Station. Please call the hotel or dial 3090 from the stations courtesy phone and one of our award-winning drivers will assist you. The Metrolink tram stop is located within Manchester Airport train station. Trams run up to every 12 minutes during the day to the city centre and greater Manchester area including Old Trafford and the Etihad Stadium. Tickets are purchased from machines on the platform before you board the tram. 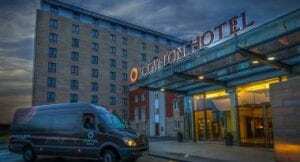 For complimentary transfer to Clayton Hotel Manchester Airport simply call us or dial 3090 on the stations courtesy phone and one of our friendly drivers will assist you.